DESCRIPTION: ElastaHyde is a 100% acrylic, premium quality, high durability, elastomeric coating. It has been developed to protect various roof surfaces and contribute to substantial energy savings. ElastaHyde (white) reflects over 84% of Sun’s rays and serves as a thermal reflector due to hiding & reflective pigments. 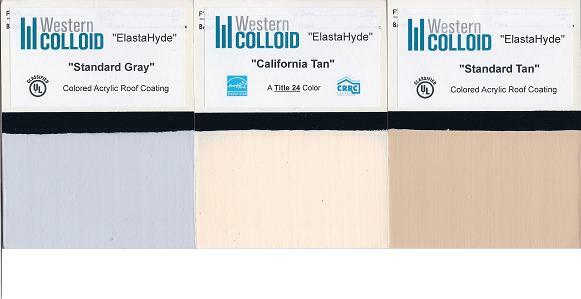 As an ENERGY STAR® Partner, Western Colloid has determined that this product meets the ENERGY STAR® guidelines for energy efficiency. 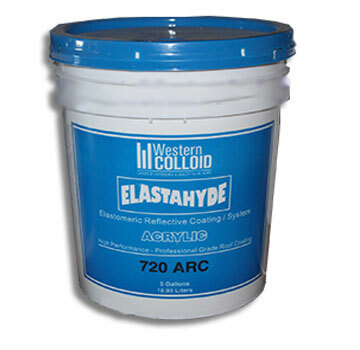 ElastaHyde 720 ARC is listed by the “Cool Roof Rating Council” and meets California Title 24 requirements. When cured ElastaHyde forms an extremely tough, flexible film that can withstand the most rigorous weather conditions. ElastaHyde is designed as a surface coating for Western Colloid “Fluid Applied Reinforced Roofing” membranes and metal roof systems. T272 Grade Stitch-Bonded Polyester Reinforcement Fabric, Soft-Finish 3-Oz / Yard. 20-inch X 324 ft. Roll. Used with Acrylics and other Liquid Roof Coatings. Price/Roll.